The main new features in spm1d version 0.4 are listed below. Additional documentation will be added following peer review. All statistical tests can now be conducted non-parametrically through the new spm1d.stats.nonparam interface. The key difference is the “iterations” keyword for non-parametric inference. This sets the number of random data permutations used. Setting iterations to “-1” performs all possible permutations. Nichols TE, Holmes AP (2002). Nonparametric permutation tests for functional neuroimaging: a primer with examples. Human Brain Mapping 15(1), 1–25. For more details refer the example scripts listed below. The standalone scripts construct CIs outside of spm1d and show all computational details. Normality tests can be conducted using the new spm1d.stats.normality interface. spm1d provides convenience functions for all statistical procedures, making it easy to assess normality for arbitrary designs. Python 2.7 and Python 3.X will both be supported for the forseeable future. The rft1d package, which spm1d uses to compute probabilities, is now packaged inside spm1d. All rft1d updates will be pushed to spm1d, so now you only need to keep spm1d up-to-date. Results from two- and three-way ANOVA are now much easier to summarize, visualize and navigate. Here Y is the data array, and A and B are vectors containing experimental condition labels as integers, one integer label for each row of Y. The main effects A and B and the interaction effect AB are listed along with the degrees of freedom and the null hypothesis rejection decision. All statistical routines in spm1d.stats now accept a keyword “roi” for conducting ROI analysis. Pataky TC, Vanrenterghem J, Robinson MA (2016). Region-of-interest analyses of one-dimensional biomechanical trajectories: bridging 0D and 1D methods, augmenting statistical power. PeerJ 4: e2652, doi.org/10.7717/peerj.2652. See the Appendix for a description of spm1d’s interface for ROI analysis. This update contains major edits to the ANOVA code. THEN inference is approximate, based on approximated residuals. TO AVOID THIS PROBLEM: use multiple observations per subject per condition, and the same number of observations across all subjects and conditions. Now only available for two-sample t tests and one-way ANOVA. The correction for one-way ANOVA is approximate and has not been validated. Non-sphericity corrections for other designs are currently being checked. 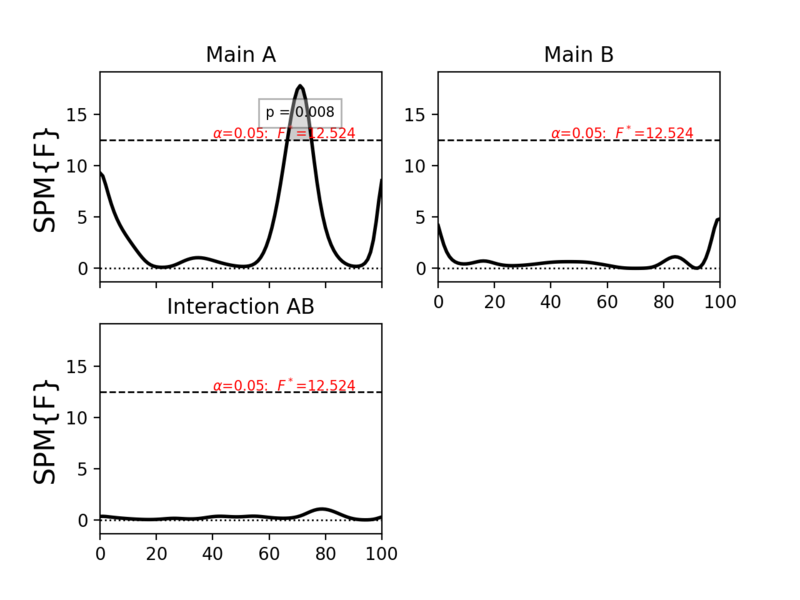 spm1d.stats.manova1 — one-way multivariate analysis of variance. 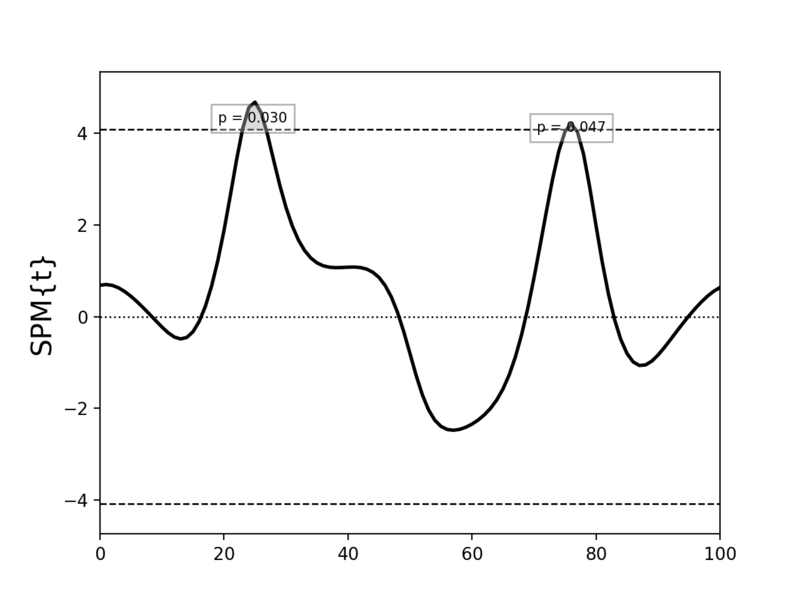 All spm1d.stats functions now support both 0D and 1D data data analysis. The scripts compare spm1d results to third-party results (from SAS, SPSS, Excel, R, etc.) for a variety of datasets available on the web. spm1d’s MATLAB and Python syntaxes are now nearly identical. spm1d now uses the rft1d package for conducting statistical inference. Other rft1d procedures like broken-field analysis and element- vs. node-based inferences will be integrated in future versions of spm1d. 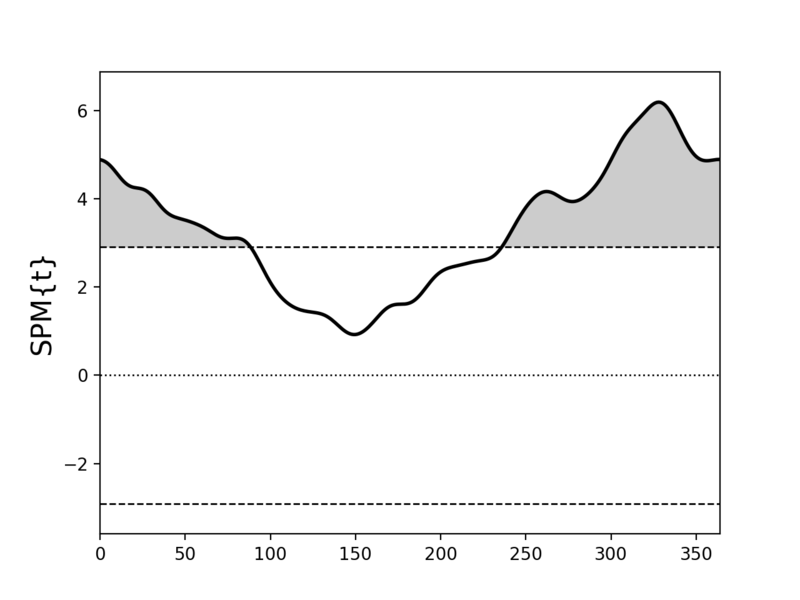 The cluster-level p values are 0.015 and 0.023, but the set-level p value (<0.001) is much lower. Cluster-level p value : the probability that 1D Gaussian random fields with the observed smoothness would produce a suprathreshold cluster with an extent as large as the observed cluster’s extent. Set-level p value : the probability that 1D Gaussian random fields with the observed smoothness would produce C suprathreshold clusters, all with extents larger than the minimum observed extent. 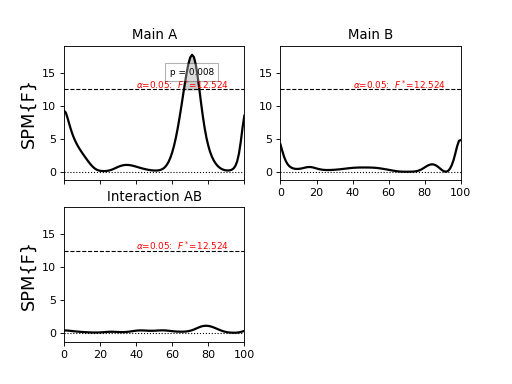 Set- and cluster-level probabilities are identical when there is just one suprathreshold cluster. If the first point in the 1D field is homologous with the last point, like in calendar years or gait strides, then the field is ‘circular’. Consider the following example from Ramsay JO, Silverman BW (2005). Functional Data Analysis (Second Edition), Springer, New York. There appear to be two suprathreshold clusters, but Day 0 is homologous with Day 365, so in fact there is just one suprathreshold cluster. If the example above is regarded as circular, we get a single cluster-level p value of approximately 0.000003. 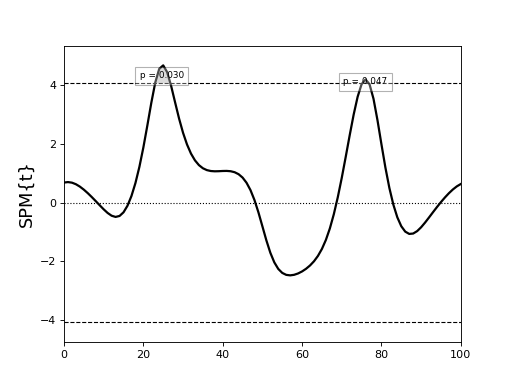 If instead it is regarded as non-circular, we get two cluster-level p values of approximately 0.006 and 0.001. Use the keyword circular when conducting inference to specify whether or not the field is circular. By default circular is False. spm1d now interpolates to the critical threshold u as depicted in panel (b) of the figure below. Source code for both Python and MATLAB can be cloned and updated from github.com.